Cylindrical thrust bearings are available in single-row with various variations including NU, N, NJ, NF, NP, and NUP. Features one-row of cylindrical bearings with a separable inner ring with a cage and roller complement mounted to the outer ring. This cylindrical bearing consists of two integral ribs on the inner ring that retain the rollers and cage. These bearings support heavy radial loads and have the ability to carry light, unidirectional thrust loads that are up to 10 percent of the radial load. Features two integral ribs on the outer ring and a single rib on the inner ring. Able to carry incidental thrust loads, this bearing type features two integral ribs on the inner ring and a single rib on the outer ring. 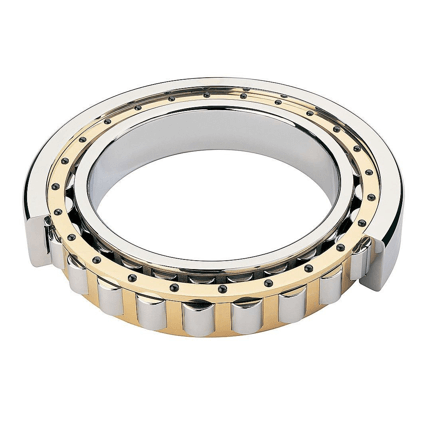 This bearing type can carry light thrust loads in both directions and may be used with a type RN or RU to accommodate axial expansion and contraction. It has two integral ribs on the outer ring, one integral rib on the inner ring. Able to carry incidental thrust loads in both directions this type may be used with a type RN or RU to accommodate axial expansion and contraction. The design has two integral ribs on the inner ring, one integral rib on the outer ring.